The Climate is Changing – It’s Time for Solutions! See www.seattleplus10.org for lots more info! CAGJ IS SELLING T-SHIRTS WITH THIS LOGO HERE! $15 FUNDRAISER…RED & WHITE STANDARD T-SHIRTS; RED AND LIGHT BLUE FITTED T-SHIRTS, & RED KIDS T-SHIRTS! CALL FOR MORE INFO, GET YOURS AT THE PEOPLE’S SUMMIT, OR BUY THEM ONLINE! WEEK OF ACTION Where will you be? Friday Nov 27: Amy Goodman & The Yes Men! Saturday Evening: Dinner and Program at New Hope Baptist Church – FREE! Sunday Nov 29: People’s Summit 9 – 5 Seattle University – FREE! Monday Nov 30: Noon at Westlake Climate! Justice! Assembly; 4:30 at Westlake: Action for Immigrant Rights. 7pm Eric Holt-Gimenez, Director of Food First, speaks at UW Gould Hall – FREE. Check out other N30 evening events. Thursday Dec 3: “This is What Democracy Looks Like” at MOHAI! Saturday Dec 5: Caravan with CAGJ to Portland D5 Action! Tell your friends: Please send an email announcement about the People’s Summit to your members/friends/family now, and again a few days before the event, by forwarding this newsletter, or a shorter announcement. We have a template email blast available online. Social Media: Help spread the word via your social networks on Facebook — become a fan and join the People’s Summit group—and find us on Twitter at @seattleplus10, using the hashtag #seattleplus10. Help Make Another World Possible! Especially for Child-care, Interpretation (English/Spanish), and Day-of! The Yes Men will participate in the People’s Summit throughout the week-end! The Climate is Changing: It’s Time for Solutions! 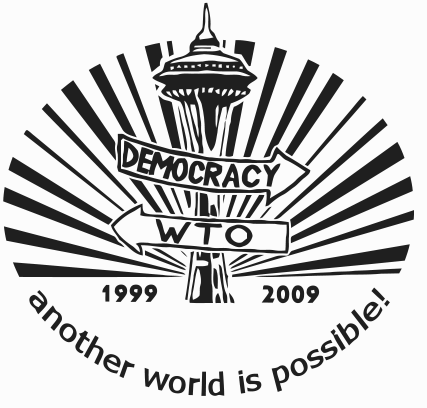 Launching the People’s Summit, the Opening Plenary will reflect on what we have accomplished, and the lessons learned from our collective victory over the WTO in 1999, and connect that watershed moment with the struggles for justice today. The Climate is Changing. We know that means we have to take urgent action for climate justice. But it also means that this is the best opportunity we have had in a long time to put forth viable solutions for people and the planet. The People’s Summit begins with specific ways we can all build alternatives to make another world possible. Please note: The workshop schedule may change! Join us to reclaim and amplify our voices with the vision we have for a healthy planet and people – Community Empowerment, Jobs, Prison Reform, Food Security and Native Sovereignty! Performances by Jim Page & others! The closing celebration of The People’s Summit is an opportunity for leaders in labor, environmental justice, cultural activism and food sovereignty to move forward a shared vision for Global Justice, reflecting on the significance of the 2009 WTO meeting on November 30th, the 10th anniversary of the WTO shutdown in Seattle, and the upcoming Climate Change talks in Copenhagen in December. Participants will be encouraged to reach across sectors and borders to strengthen alliances, drawing inspiration from the People’s Summit to forge shared goals for the next 10 years and more. Performances by 206 Zulu, Jack Chernos, Seattle Labor Chorus & others! Posted in News, Projects and tagged People's Summit, trade justice. Please let me know if any of the proceedings of the summit were archived and are available for streaming on the web. Thanks.